You are at:Home»Around the Web»Garbage bin that rewards you with free WiFi! Realizing the need of the Internet in everyday life, two commerce graduates decided to give free WiFi to people in exchange of a cleaner surrounding with an unique initiative — a ‘WiFi Trash Bin’. 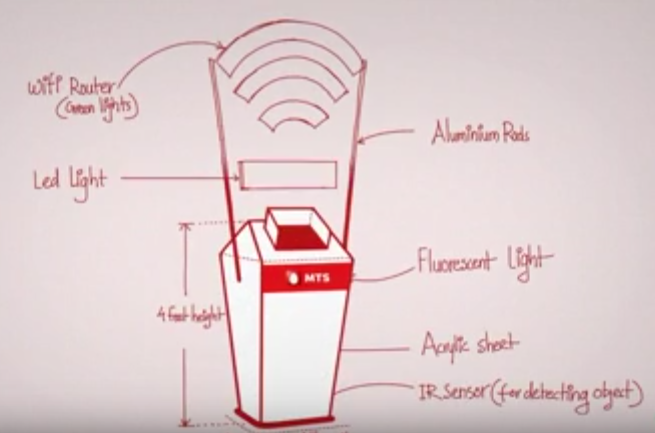 “When somebody dumps trash into a dustbin the bin flashes a unique code, which can be used to gain access to free WiFi, says Prateek Agarwal, one of the two founders of the initiative. He and his partner Raj Desai hit upon the idea while visiting the NH7 Weekender a music festival which is spread around a large area and as music festivals go is home to music food drinks and of course a lot of garbage.